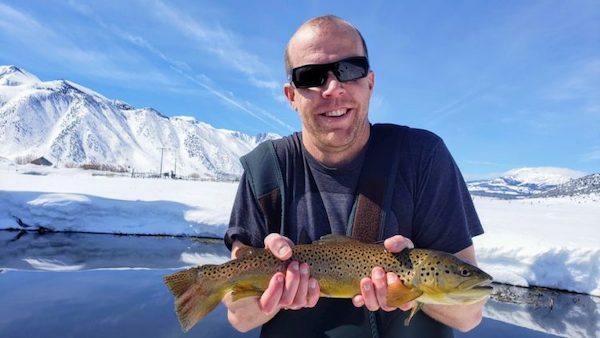 Brian Barkley had it bad and needed a winter fishing fix. He had never fly fished, but was a hot shot with the spin gear so he decided to switch it up on Hot Creek with me and give it a try. He had a great day! It was an all day bite here with soft eggs a couple of days ago. Excellent numbers of browns and rainbows and the coloration on these fish is just stunning right now. The previous years’ plants have adapted to the creek and taken on a resident look. Fish deep and get your flies down in the morning until you see the fish rising in the afternoons. You can then get them on #20-22 Paramidges fished in the film along the foam lines and in the eddies. Still some deep snow walking in to the Interpretive site and it becomes even more dicey if you are making the descent into the canyon, but can be worth the hike. #18 BWO’s, #18-22 Parachute midges, and Otter eggs and SD Crawlers have been getting some serious looks and takes from the resident trout.